To be frank, there were not many real surprises for me at Essen this year. This is mainly due to the flood of information that is readily available on the internet ( and largely due to Eric Martin's awesome Essen updates and preview ). Russian Railroads did surprise me but only for the fact that it wasn't a train game but a train themed worker placement game. I completely blocked it out of sight once i saw it resembled a train game. A mistake on my part. So for the fact it was a great game, that was a major surprise. But one big surprise of Essen is finding a small booth that was demoing a game called Shephy. 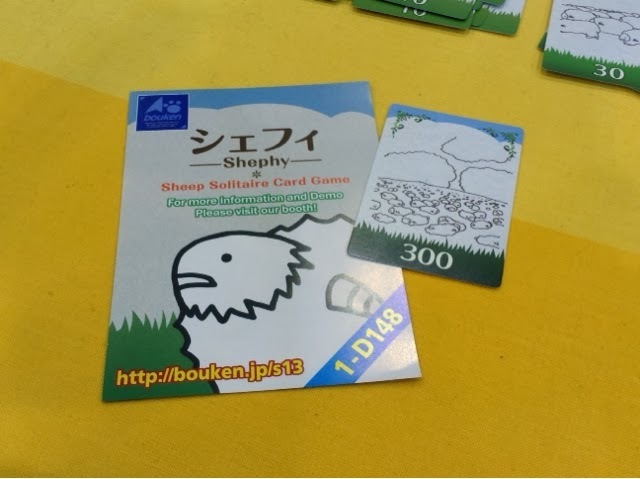 As written there, it is a sheep solitaire card game. That's possibly the best way to describe it. 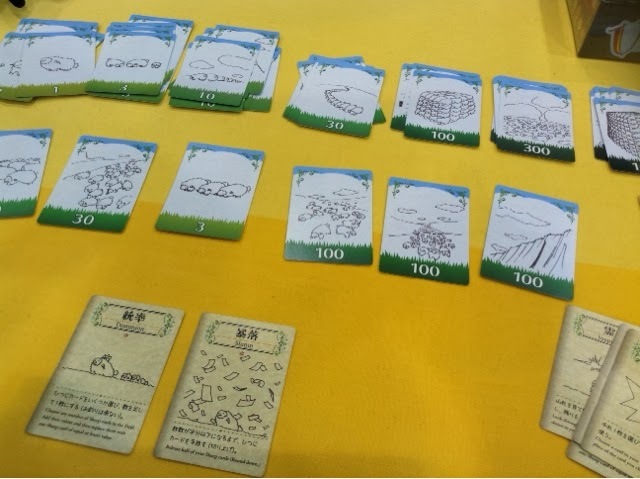 In Shephy, players are trying to multiply their starting sheep of value 1 into a value of 1000 after 4 rounds ( maybe 3, seriously can't remember ). This is achieved by playing action cards from your hand to manipulate your sheep cards. You have a field that can hold 7 sheep cards and through your actions you can remove some cards, level up others, or combine them to form a higher number. All you need is one card of 1000 sheep in your field to win. The breakdown of the sheep numbers are 1, 3, 10, 30, 100, 300, 1000. Each value has multiple copies and you may have any combination in front of you that doesn't exceed 7 cards. The card actions that you have in hand are mostly beneficial abilities like: combining the value of your sheep, copying a card value, upgrade your sheep cards by one level ( excluding highest level card ), copy the ability of another card, remove a card from the game. On the other hand, the negative cards are fewer but REALLY nasty. Downright mean. Some include, discard 7 sheep cards ( = instant lose ), remove all of your highest level sheep, remove the highest level sheep card. Each round ends after you have played all your cards ( both good and bad ). So its only through careful planning and some lucky draws will you be able to hopefully bring your sheep value up through each round. Knowing the card effects is very important and thus only through multiple plays will you be able to achieve victory. 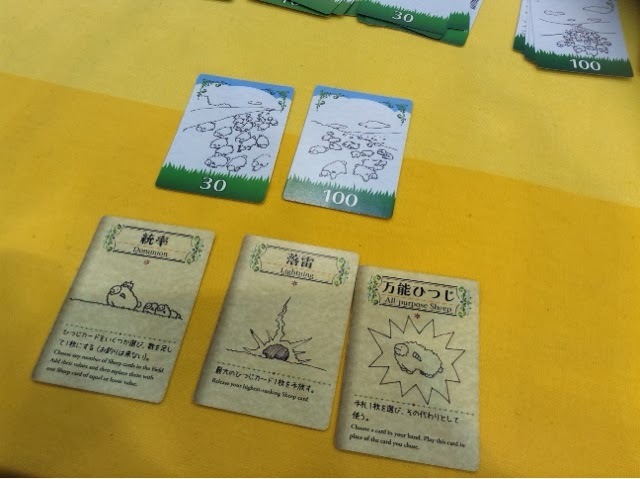 I only played one demo game and I ended up with one 300 sheep card as my final score. Not even close to the required 1000 sheep. As you can see above, my three action cards really couldn't help me much at the end of round 2. I have 3 left because I played all the other cards already ( normal hand size is 5 cards ). In essence I was doomed to lose my 100 sheep card through lightning. The game from what I have played is TOUGH. People say Friday ( the game ) is tough, but I found it pretty easy on most levels. But this one seems like it might be more difficult. I asked the demo lady if she has ever beaten it but her answer was no. She did see people get as high as 3000 ( 3 x 1000 sheep card ) but that was rare. I loved the art. Very much. Each card has different art. Really. Each and everyone. Even the deck with all the sheep cards all have different art. All the 1 sheep are different images of a sheep, all the 100 sheep cards also different. Very rewarding to play and look through the art. I guess it keeps you calm when sh*t is happening to your beloved sheep. I would have picked up the game there and then but it was not for sale. They said it would be sold later in the year so I might pick it up then if shipping isn't a bomb. I'm not certain about the replayability but I think it might be awhile before you have it beat. Shephy looks and plays well as a single player game. If you are into that sort of thing, you might want to give it a look when it's out. Love the loko of this! I like Friday a lot so can't wait to try it!